to His Family in 1862. 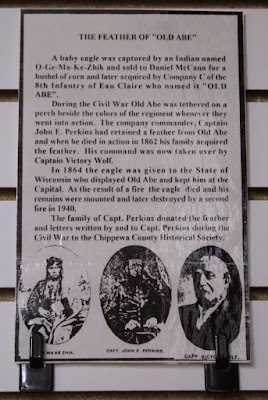 The "Old Abe" Eagle Feather exhibit is located at the Chippewa County Historical Society Area History Center and Museum on the southwest corner of the intersection of Allen Street and South Prairie Street, at 123 Allen Street, Chippewa Falls, Wisconsin 54729. THE FEATHER OF "OLD ABE"
A baby eagle was captured by a Indian named O-Ge-Ma-Ke-Zhik and sold to Daniel McCann for a bushel of corn and later acquired by Company C of the 8th Infantry of Eau Claire who named it "OLD ABE". During the Civil War Old Abe was tethered on a perch beside the colors of the regiment whenever they went into action. The company commander, Captain John F. Perkins [sic] had retained a feather from Old Abe and when he [Captain Perkins] died in action in 1862 the family acquired the feather. His command was now taken over by Captain Victory Wolf. In 1864 the eagle was given to the State of Wisconsin who [sic] displayed Old Abe and kept him at the Capital. As the result of a fire the eagle died and his remains were mounted and later destroyed by a second fire in 1940. The family of Capt. Perkins donated the feather and letters written by and to Capt. 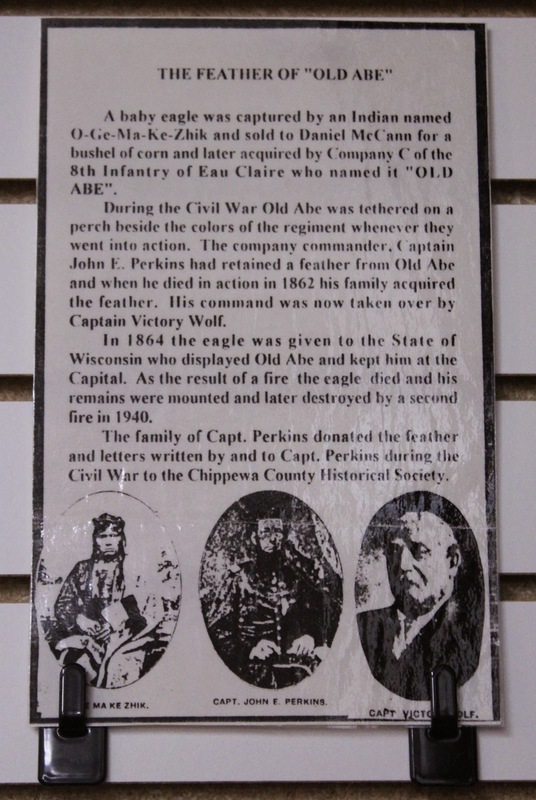 Perkins during the Civil War to the Chippewa County Historical Society. "Old Abe" and the 8th Wisconsin. at the Chippewa County Historical Society Museum. The "Old Abe" Eagle Feather exhibit . . .
Chippewa County Historical Society Area History Center and Museum.